Stretching from Cancun to Tulum, the Riviera Maya is approximately 50 miles of soft sandy beaches and sparkling turquoise water. This renowned and well-loved tourist destination is well-equipped for fun, world-class diving, gourmet food, evening strolls on the beach, and so much more. Given the variety of things to do here, it’s not easy narrowing it down to just 10, but here it goes. In the past decade, Avenida Quinta or 5th Avenue, a once sleepy fishing village in Playa del Carmen, has turned into a full-scale resort town. A pedestrian friendly district, it stretches for 70 blocks, and is lined with shops, bars, and restaurants. From people watching to street performers, “La Quinta” as the locals call it, is sure to entertain you. According to historians, the earliest evidence of the Maya people dates to 1800 B.C. And, it was these Mayas who built huge pyramids, developed the complex Maya calendar, and created hieroglyphic scripts. While the jungle reclaimed many of these temples, roughly a dozen of them have been excavated over the years. The two best known, are Tulum, perched on a cliff overlooking the Caribbean, and the larger Chichen Itza, a Maya city thought to be active from about 600 A.D. to 1200 A.D. There are many guided tours that will take you to Chichen Itza or alternatively you could hire a driver. Every summer, whale sharks migrate to the waters surrounding Cancun and Cozumel, and people come from all over the world to snorkel with them. The pristine barrier reef also offers plenty of opportunities to admire the colorful tropical fish, stingrays, and other sea life that are in abundance year-round. 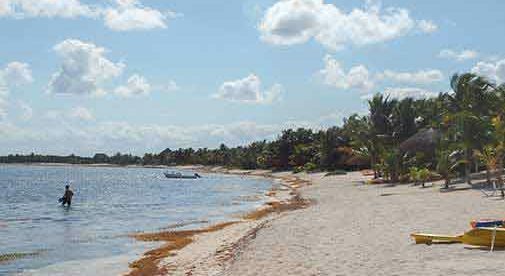 There is also good snorkeling right off the beach, on Cozumel. If your idea of relaxation includes your feet in the warm sand, and a $2 cerveza (beer) in hand, you’re in luck. You can let your thoughts drift away with the current, at one of the many ocean-front beach bars. A palapa (thatched roof hut) overhead will protect you from the strong sun, and fresh ceviche (seafood dish) or delicious tacos will keep hunger at bay. In Playa del Carmen, massage tables dot the beach. Why not treat yourself to a $20 massage, and you will experience the wonders of having someone work out any knots, while listening to the soothing sounds of the waves just 20 feet away from you. Close to Tulum, in the Akumal Monkey Sanctuary, rescued spider monkeys, macaws, and other animals, are rehabilitated and in some cases released back into the wild. Here you can experience a personalized four-hour tour, deep in the jungle, where you can interact with some of the animals, learn about the eco-system, and even cool off in the Sanctuary’s cenote. Cenotes or sinkholes, are a distinguishing feature of the Yucatan Peninsula. They occur when the natural limestone collapses exposing fresh water underground, and a cooling swimming opportunity. Hundreds of cenotes are scattered through a 100-mile radius, and only a decade ago a 30-mile long network of rivers was discovered. Some cenotes are underground, and you reach them by stairs leading into a cave-like environment, where hundreds of stalactites and stalagmites surround you. Others are more like swimming pools. Many cenotes are open to the public and have an entry fee of $5 to $6. Yes, you read that right. While camels aren’t native to Mexico, a few enterprising tour operators offer a “camel safari”, just outside of Playa del Carmen. Here participants experience what it’s like to sit astride the humped creatures as they pick their way through the sand. From ziplining, to off-roading in the jungle with ATV’s, there are many opportunities for thrill-seekers in the Riviera Maya. Just minutes from the city of Playa del Carmen, there are Xcaret, Xplor, and Alltournative eco-parks to boost your adrenaline. There you can choose day-passes for around $95, or reserve specific activities depending on your interests. If observing hundreds of species of birds and wildlife is your idea of fun, then you’ll appreciate the Sian-Ka’an Biological Reserve. Located just outside of Tulum, and 45 minutes from Playa del Carmen, it is the largest protected area in the Mexican Caribbean. This stunning area is a UNESCO World Heritage site, and guided boat tours give you a glimpse of crocodiles, dolphins, sting rays, and much more sea life. There are also dedicated tours for bird watching, hiking, kayaking, and snorkeling. There’s so much to do at Sian Ka’an that you can go multiple times and still find something new to discover. Perhaps the best thing to do in the Riviera Maya is to nap in a hammock knowing there’s a world of opportunity that awaits you anytime you’re ready.